I see this at least once a week and this problem is not only unnecessary but also seems to be gender neutral. In walks a patient, with an otherwise very expensive ($400+) or even an inexpensive (<$25) pair of shoes, having an almost irreparably worn down heel. Don’t let this be your shoe. Instead, march your excessively worn heels directly to your local shoe repair shop. They’re professionals and for less than a bargain matinee and a large bag of refillable popcorn, they can create a good as new, flat level heel. Now isn’t that worth it? In San Francisco’s Financial District, check out Jack’s Shoe Service (415.989.9434) or Anthony’s Shoe Service (415.781.1338). I have used and recommend both. Check em’ out. I had a patient come in yesterday with a great pair of 3-strap adjustable sandals. When I had her slip them on and walk, I was amazed at how poorly they stayed on her foot. Walking down the hall, her heel was slipping sideways and her arch appeared to drag nearly on the ground. Because none of us spend much time adjusting straps when we purchase sandals, the following is a brief instructional on a one time correct fit maneuver. Once done, you don’t have to adjust again. This simple adjustment sequence can mean the difference between comfort and sloppy. If you have a sandal with one of the straps being behind the heel and the other one or two over the top of the foot, you always need to fit it to your foot as follows. Open up all straps and make sure your heel to ball fits the heel to ball of the sandal correctly. Start securing straps at the toe first. Heel strap should be secured last. 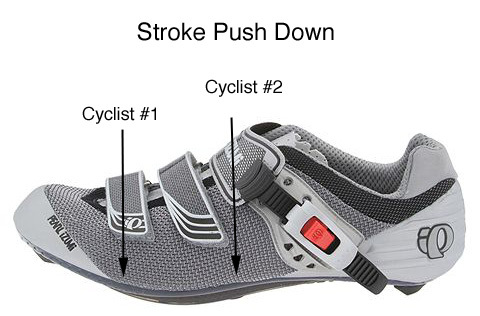 Leave forefoot and heel strap alone and use ankle strap to get in and out of shoe. Perfect Prada’s – Heel & Vamp & Adjustable Upper Straps. First thing Monday morning, my very stylish patient Anne arrives to pick up her new running orthotics when lo and behold, I see that she is wearing a stunning pair of Prada platform heels. Platform design gives the illusion of added height without actually adding height. Platform sole and heel are wooden and very stable (think Dr. Scholl’s wooden sandals). Heel style comes straight down from counter of shoe. If given a choice, this will always be better heel design than say a kitten heel or other off center style heel. While shopping with my husband this afternoon I looked down at his heels and noticed, he was like one of the cobbler’s children without any shoes. He was walking on the outside of the heels of his shoes to the point that he looked like he had a limp and was hobbling from side to side. When I asked him how he could possibly walk pain free in his shoes, he replied, “I can’t, so we won’t be shopping for long”. Fortunately we were right next to Nordstrom and could buy new shoes, because we had a lot of shopping to do. Once in the men’s shoe salon I quickly wandered around and found him the following three pair of shoes. My husbands challenges are that his foot is very deep and he has a long heel to ball. Lace styles suit him best, but he is drawn to slip-ons because of the ease of getting them on and off. He wears orthotics for functional hallux limitus, i.e. 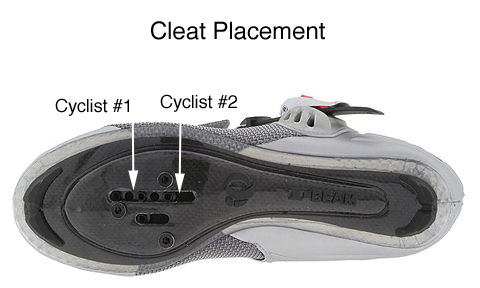 sore big toe joints and is most comfortable when the shoe is torsionally stable and has an inflexible forefoot sole. Within 5 minutes, I had the following three contentenders in hand. Much to our dismay, when the shoes were retrieved, my husband was unable to fit his orthotics into the shoes. Although all shoes had removable foot beds, the heel cup of his orthotic was unable to seat fully back. The result, a tight fit in the vamp and excessive heel slippage in the back. It didn’t matter whether the shoes heel counter was soft or firm, the orthotic would still not seat back. Worried that we still wouldn’t be able to shop, because it was increasingly apparent my husband wouldn’t be getting shoes, I thought AHA, I know, lets remove the custom orthotics and insert a pair of mens 3/4″ Superfeet instead. 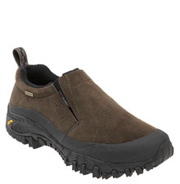 Within a minute of trying these beauties on with the Merrell’s – order was restored in the world. With a kiss and hug, my prince charming had found his slipper that fit. From then on he commented more than once on how he felt as though he was walking on a cloud. Three very similiar patients; one female and two male, having narrow, bony feet have all had chronic, longstanding arch and/or heel pain, accompanied by extreme plantar foot “sensitivity” and pain for many years. Each were on the brink of disaster alignment-wise, when a seemingly benign event (new orthotic, unexpected prolonged hiking) occured, changing them forever, sending them along a downward spiral of worsening, unrelenting foot pain. All have see countless foot specialists (podiatrist,orthopedists) and have tried a bundle of different shoes and orthotics with no success whatsoever. All have also presented with shoes that are too long and deep for their bony, skinny feet. As a board certified orthopedic podiatrist, I would have previously tried to cushion their orthotics or grind in a plantar fascial groove to offweight an otherwise tight, bow strung, plantar fascia. What I have learned instead, using F-Scan pressure mapping is that standard orthotic treatments don’t always work. Instead, fine tuning the trajectory parameter is essential to prevent excessive dorsiflexion of digits 2 or 3 during the toe-off phase of the gait cycle. Before and after results are listed below. Symptomatic relief using these principles in my three patients has not been immediate, but over 2-3 months time, all patients were 80% improved from before the study trial.